Here is a quick guide to show you how to install texture packs and shaders in Minecraft. I know there are probably countless threads and videos on other forums, especially the Minecraft forums, but this is just a quick and simple version for us Codexians. I was motivated to make this by this thread/post and I hope it helps! I am adding images and will make a video soon. WARNING: The current version of Minecraft as of posting this is 1.8.1. This guide will be using resources that are for 1.8 and 1.8.1 so not everything will be compatible with clients or servers that are newer. Some things made for 1.8.x will be compatible for other updates within the major update of 1.8.x. Download the texture pack you want to use. I will use Flow's HD 128x for example, as shown in this thread. Now you will have the file, this one is called 1.8flowshd.zip. Notice: Flow's HD 128x is for Minecraft 1.8. The 64x version is still for Minecraft 1.7.10 at this time. Navigate to your .minecraft folder. It is just called minecraft for Mac OS X. Linux is still .minecraft. Now navigate to the resourcepacks folder. Cut and paste your zip file that you downloaded to that folder. You will see the Available and Selected Resource Packs. Move the one you want to use from Available to Selected by clicking on the arrow that appears when you hover or that pack. That's it! Click Done and it should load the texture pack. For different mods, the instructions will be different. These instructions are mainly for installing OptiFine and Shaders Mod to increase performance and be able to use shaders. I recommend that you refer to each mod's own forum thread on the Minecraft forums for more detailed instructions on how to install and use them. Notice: These will create new profiles in the launcher and you need to use the profiles with ones you want installed. You can download the one for either 1.8.1 or 1.8.0, or both. The OptiFine 1.8.0 HD U B6 version works with Shaders Mod so you can use both at once. This will allow you to use Shaders and also get a performance boost to help increase FPS. Notice: At the time of writing this guide, the C1, C2, and C3 versions of OptiFine have been released but ShadersMod has not been updated to account for them yet so I will be using the B6 version. You could download from their website or check the forum thread for more information. Once you have the file, just run it. Click Install and it should tell you if it installed successfully. In order to have OptiFine be in effect, you have to used the new profile that it has created. When you launch Minecraft, you should see it has created a new profile called OptiFine. I recommend renaming this to 1.8 OptiFine or 1.8.1 OptiFine to distinguish them if you install multiple versions. Once you have the ShadersMod-v2.4.6mc1.8-installer.jar file, run it. WARNING: Make sure you have the version of Minecraft you are installing the mod for. To ensure this, open the launcher create a new profile. Name is 1.8 Minecraft or something and use release 1.8 for the version. Launch 1.8 and then quit game after it's done loading, close the launcher as well. Make sure the game and launcher are closed before installing this mod. Click OK through the options that come up. It should tell you when it is finished. Now you can move down to the Shaders (Packs) section for installing different shader packs. I will be using SEUS shaders for example. There are various others. Go to the forum page linked above and scroll down until you see the downloads like in the picture below. Download the version you want, the options are: Standard, Ultra, Ultra DOF, Ultra Motion Blur. You can test them all to see what your computer can handle or what version you like. You should get a file like SEUS-v10.1-Ultra.zip or the names for your versions. 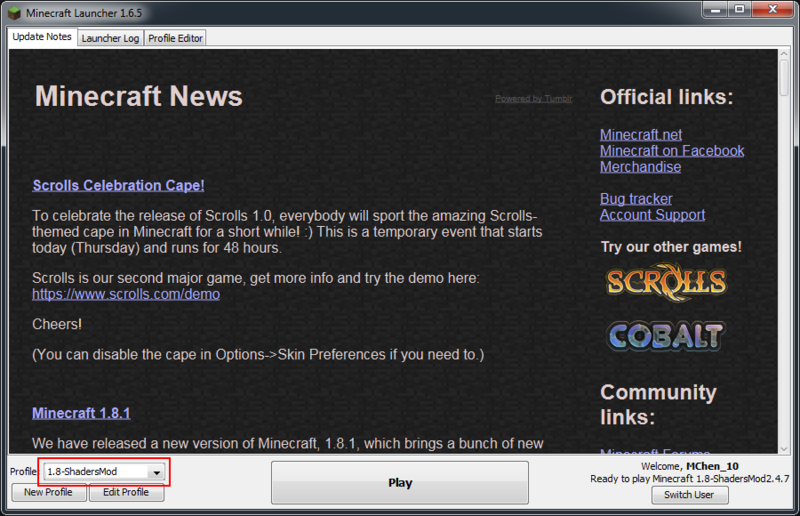 Navigate to your Minecraft directory again. There should be a shaderpacks folder. Move the .zip file(s) into that folder. Now open the version of Minecraft with the Shaders installed. It should be a profile called 1.8-ShadersMod. Go to Options... then Shaders and you should see them listed there. Select the one you want and click Done. Let me know if you have any comments or questions! If there is something you would like added or feel is important, feel free to suggest. Edited by MC10, 18 January 2015 - 02:30 PM. Does this mean you're playing with us @MC10 ? Maybe haha, we'll see . I haven't even read it and you rock. Thank you thank you thank you. May have questions in a few minutes. But still. Thank you for doing this! Hmmm. I followed your exact instructions for the Flows (except I opted for 64 instead of 128) and it's in with the others I frequently use, but when I open Minecraft, it doesn't show. Which OS do you have and version of Minecraft you are using? So you put the zip in the resourcepacks folder but it's not showing up while others do? Judging from the file name, 1.7.10_flows_hd_64x.zip, it looks like it's for Minecraft 1.7.10. I'm not sure if it works with other versions. Awesome guide! Yep might want to specifically indicate anything that is specifically for any version prior to 1.8.1, as the Neocodex server that many of us participate on only functions for folks using the newest version anyway. 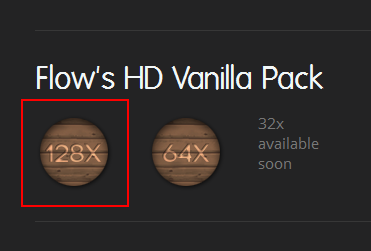 Oh never mind, I just realised Heather was trying to use the 64x pack. I used 128x. Yeah I noted some parts in the guide while making it. I'll definitely go back and detail it some more though. Yeah Flow 128x, which you use I believe, is 1.8 so it should be compatible with updates 1.8.x but the 64x version which Chameleon used is 1.7.10 so it may not be compatible. I'm not completely sure on that though. @Chameleon, try the 128x pack and if that works then it's just that the 64x version doesn't work with 1.8 yet. Edited by MC10, 09 January 2015 - 03:33 PM. Well then I'm guessing that Minecraft version doesn't have anything with being able to use it...hmmm I wonder what is going on with @Chameleon's attempt to use it then? I haven't messed with it but may later to see if I have issues with it or not. @MC10 Yeah, 128 shows up. COOL! I'll have to check that out later too. I found it is a hell of a lot less laggy on the server for me using it. I think Chroma Hills is just that detailed that it saps a lot of memory. Reckon I'll switch back to it at some point, but I'm loving the 'modern' look. I definitely want to give it a try then, anything that helps reduce lag is definitely worth a shot. Maybe we could add a list of popular texture packs and shaders or just ones that you guys like and use. However you'd prefer to do it! I actually have a habit of testing out various packs off and on...it's just kind of fun to do. I'm not even going to mess with shaders (it slows things down for me anyway), so we can be shadeless together. Now it just crashes altogether. Maybe the computer can't run them or there are mod incompatibilities. Do you have any other mods installed and which method did you use? @MC10 my system runs half as hot now using Flow versus Chroma Hills...totally awesome! Flow was Strat's recommended texture pack from the other thread. That's good though! I'm not using any atm since my laptop can't handle it. I really need to get back to my desktop haha. I like Ovo's Rustic or John Smith's Legacy. Ovo's Rustic is very nice, I keep that one around, but Chroma Hills is my VERY fave. Edit: I've run other mods before but this one always fails for me.